Over Memorial Day weekend the weather was predicted to be awful. It was such a bummer too because Memorial Day weekend typically marks our start to Summer. School's out and the hubbies travel is put on hold for an extra day. We typically celebrate on the lake and reflect on all those who gave us the great gift of doing so. And while we still had plans on doing the later, the former wasn't going to happen - at least according to the weather man. I was prepared for this, but Mr. Cute had other plans. He came home Saturday morning from his CrossFit work out and proclaimed, "I just booked us a weekend stay at the new Great Wolf Lodge!" Now, I think I didn't speak for a whole minute and my jaw just hung open in sheer shock. Mr. Cute loves a good adventure, but themed water park hotels did not seem up his alley. Especially since we already tackled Disney this year, and he's had his fill of kid themed adventures. Not ever being one to shun a good hotel stay and meals made by other people, I promptly went and packed our bags. The Great Wolf Lodge just opened this location in Atlanta, and it happened to be opening weekend. Check in wasn't until later in the afternoon so we hung around the house for a few hours before hitting the road. I was so glad too because Cute and I were able to catch Boo-Boo's tournament game that was being played like five minutes from my house. After the game we grabbed some lunch and made our way south to LaGrange, GA (about an hour Southwest of Atlanta). We arrived at the tail end of check-in and the place was packed. I was actually glad we didn't arrive until the end of it because there was a really long line the next day for check-in and you have to check-in before you do any of the activities. Waiting a long time with three super excited kids would have been tough, especially since there is so much to see/do right when you walk in. I know Carrie Beth and her family visited the Great Wolf Lodge in North Carolina a few years ago, but I guess I had put that in the back of my mind until we arrived. I didn't realize how over the top everything was. Every little detail was thought of! Mr. Cute booked us in a Deluxe KidCabin Suite, and the room was adorable! It was the perfect size for our family of five and a great set up for traveling with kids. The Great Wolf Lodge offers several size and styles of rooms, but I think this is one of the largest ones they have. The room has a log cabin style mini room in it that contains a bunkbed, a single twin bed, a television and a night stand. It was decorated with the characters of the Great Wolf Lodge and the light fixture was decorated to look like the moon. It was a adorable and my kids thought it was the coolest thing ever. The adult side of the room contained a queen sized bed, a table with chairs, and a large television. It had that lodge feel, and the wall decor made you feel as if you were sleeping in a tent. I don't know about you, but that's my kind of camping. The one thing I can say about the Great Wolf Lodge is there is no shortage of activities. From mini golf and ropes courses to scavenger hunts and water slides. There's shows, story times, face painting, a large playroom...and I could go on and and on and on. There's a little something to keep everyone entertained literally all day long. I'll apologize now for the pic overload in this section, but we squeezed in a ton of activities in just a few short days. And when we weren't playing we were eating. There's a candy store on site, a Ben & Jerry's Ice Cream (yes, please! ), a Dunkin' Donuts, and multiple restaurants to dine from! We ate at their more upscale restaurant for dinner and a breakfast and it was delicious. For lunch we kind of all chose something different from one of the other restaurants and just sat in the courtyard area to eat. Okay if you have a trip planned and have never been to a GWL here are a few tips I wish I had known. 1: Pack tennis shoes and multiple hair ties. I didn't think about this when I was packed or getting us dressed for the day. But if your child wants to do any of the ropes courses or the climbing wall they require tennis shoes and your hair to be pulled back if it is longer. Totally for safety reasons and it was not something I thought about it. Luckily the Native shoes that the kids wear passed and I just used my hair tie when L.C. needed it on the fly. 2: Don't worry about packing flotation devices. If you want to worry about one less thing, you can leave your flotation devices home. There are tons of options available in a variety of sizes both by the big pool and the water park area. GWL was sold out while we were there and there were still tons of sizes available even at it's most crowded. 3: Off times at the water park. Obviously the indoor water park is the big draw. We noticed that from check out to check in time the waterpark was "empty". We were able to get off one ride and get right back on. We also noticed at dinner time until close it was pretty wide open too. So if you want a more "relaxing" water park experience maybe go during those time frames. 4: Bundled Passes. We did bundled passes that included pretty much everything including a few meals. Now we did this at the time because it seemed like a great deal. And trust me, if you do everything it is. But, because we were there for a shorter amount of time we didn't get to everything on the pass. And a few of the activities our kids didn't meet the height requirements (ropes course), so check and look at the activities and see what you really want to do and see what bundle would work best for you or if paying individually is more economical. My kids are 7, 4, and 2 and to give you an idea of what they loved the most: MAGIQUEST (because kids are literally running everywhere lighting up things with wands), the water park, and the arcade. 5. Lockers. I'm not sure what I thought I was going to do when reaching the indoor water park, but sitting was not an option for our crew. I had all of our stuff, but didn't want to just leave it on a chair where I couldn't see it. The GWL has a whole section of lockers available to rent. Now this part I wasn't expecting and it was semi-expensive in my opinion. Locker rental ranged from $15-$40 I think depending on size. There are tons available and kiosks set up to pay, but you have to use your credit card to pay. Since our bands paid for everything we needed I didn't think to bring money down to the waterpark. An employee pointed me to the gift shop located off the water park area and there they can accept your band as payment if needed. I am so glad they offered a place to put our stuff, but factor in the cost across your stay each day or just come in swimsuits and flip flops only. 6. Waterproof cases. Now Carrie Beth's husband packed a Go-Pro for their GWL vacation, but we left so quickly we didn't think to pack ours. 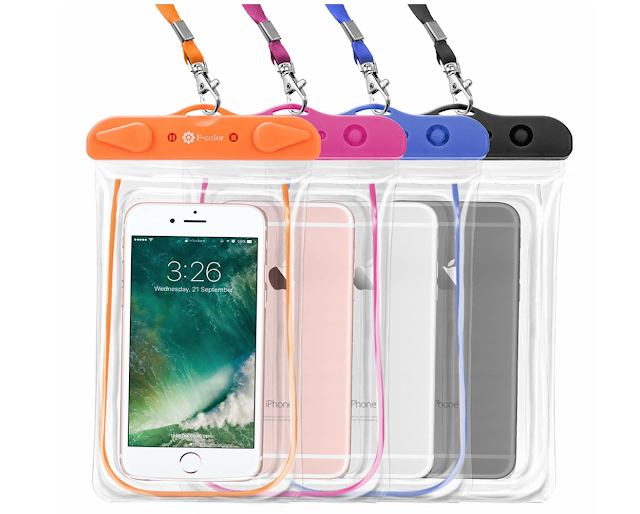 We did see a ton of people walking around with these water proof cell phone lanyards, and we thought that was so smart! Definitely something to think about if you want to capture the memories on the water slides. So that's the end of my tips. If you have ever been and have any to share please do! We definitely look forward to going again! Kudos to Mr. Cute for his last minute planning skills. It was such a fun trip and I was so impressed with the Great Wolf Lodge Atlanta. I love that it is so close to our home for a quick little getaway, and even all these weeks later our kids are still talking about what an awesome time they had.